Last week I had a really enjoyable couple of days at the In the Loop 3.5 Conference here in Shetland. I am not going to abstract the whole thing (I believe there will be a special edition on Textiles next year, which will do that for you), but I really wanted to share with you one or two of the stand out speakers. Organised by the Knitting Reference Library at the University of Southampton, the theme of the conference was on making connections – knitting means more than one thing and we make connections to it in vast, myriad ways from fashion, art, design, style, historical, geographical, connections with time and space, emotional connections…the list is infinite. It was so wonderful to see such a broad and varied list of speakers from academics, graduates, textile artists, designers and even non-textile orientated persons! Wonderful too was it to sit in the company of so many delegates most of whom were clicking away on their needles! I was excited to hear from Sylvia Dow that she was commissioned to write a play for a Stellar Quines theatre project about knitting. Set in Hawick, in the Scottish Borders, the play concentrates on female voices intertwined with a rich history in textiles as well as songs, tales and mythology. I loved that the backbone of Sylvia’s work and research came from setting up a knitting group in Hawick – bringing women together and hearing their own stories and connections with knitting. 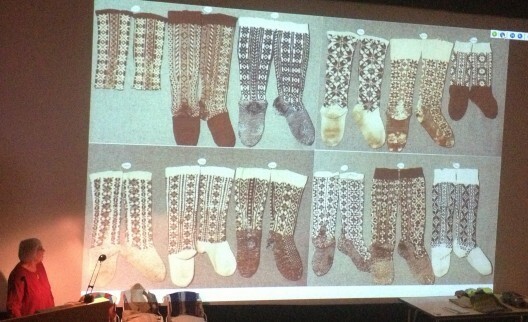 Patterns definitely have their own language and that was the topic of Kandy Diamond’s paper. She had used the Knitting Reference Library to bring examples of how patterns had evolved over the decades – from The Lady’s Book of Knitting (1884 (and which can be viewed online here)), which had scant instructions indeed; through to the introduction of abbreviations for instructions, to the pattern sheets of the 70s and 80s with dense text and perhaps more onus on image than clearly set out information. You can’t really mention patterns without thinking Elizabeth Zimmerman, who broke the mould with her conversational patterns – I just returned The Opinionated Knitter back to the library and her patterns sort of relax the eye when reading them! Kandy’s research was really interesting showing that 70% of people she surveyed were often put off by pattern instructions. I have to say, that in the past many a pattern I have had to abandon or try to write out in a better format – thankfully my favourite designers do not have that problem… probably why they are my favourites! so, yeah…you numpties who say knitting is for maiden aunts, knitting has a terminology that needs decoding – so until you can ktbl, yo, sl1, k1, PSSO, C4L or CDD you can bind right off, ok! 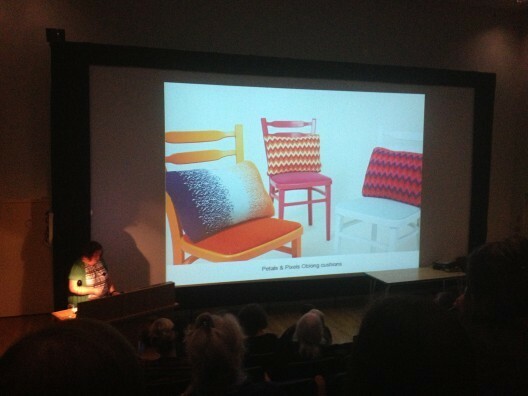 Another paper I really enjoyed was by Deryn Relph, a textile designer who has her finger on the pulse of colour and trend. Here she was looking at the inspiration behind the knitted home. We have seen so many knit-influenced designs for the home, from Fair Isle and knit-printed fabric in soft furnishings, to the wonderful cabled furniture of Claire Anne O’Brien. Deryn’s own inspirations come from archive patterns of the 1970s and the vivid colours and groovy patterns are really wonderful – such a sense of nostalgia about them, but they would not look out of place in the most contemporary of homes. I particularly liked the examples from her Button Box collections, inspired by a precious treasure of her grandma’s buttons. I think when thinking about connections with knitting the mosts resonant for me is the connection to other people and emotional connections with who or what inspires you to create. I have to say that the star speaker for me was Annemor Sundbø – I had happened upon her book, Knitting in Art, last year and I was really captivated by her story. After purchasing a ‘shoddy’ factory – where old woolens were recycled into mattress and duvet fillings – in the 80s near Kristiansand, Norway, Annemor found a precious treasure trove in the remnants of knitted garments found in the rag bins. An expert on Norwegian knitting, Annemor uses her ragpile to unravel a cultural history and form a picture of the lives of the people who knitted and wore these garments, their inspirations and their history. Annemor brought a wonderful array of examples from her rag pile and it was both one of the most amusing and interesting lectures of the whole conference. I was also so impressed by the work of Winchester School of Art graduate Alex Pengelly, particularly her work using John Arbon British wool. Emily Watts also used British wool in her graduate collection, which was inspired by her interest in the fragments of garments of polar explorer’s clothing in museum collections: her images from a trip to Svalbard where also really powerful. 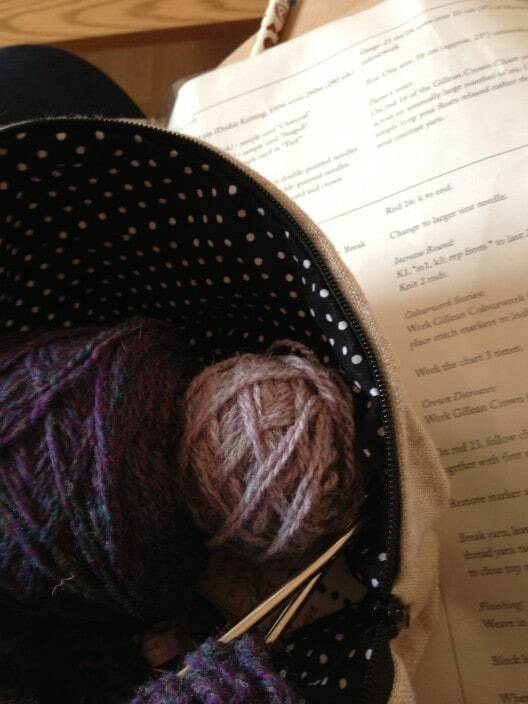 …how many connections can you make in relation to your own knitting?